A Good Sailboat Anchor Is Your Ultimate Insurance! 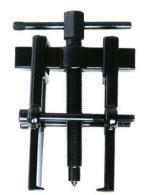 It's often said that your sailboat anchor is the best insurance you'll ever buy. And so it is - providing it's the right one! The 'right one' meaning not just the right design for the type of seabed you're anchoring on, but the appropriate size for your sailboat - and of course, even the best of anchors will fail to please if it's on too short a scope or dumped on the seabed with a load of chain piled on top of it. The following table sets out the minimum size of sailboat anchor for a vessel of a particular length. It is, at best, just a guide. If you regularly have to rely on your anchor in less than ideal conditions you'd be wise to choose one for the next boat size up. 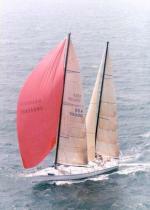 For example, on our boat Alacazam, a lightish displacement 11.5m (38 feet) monohull, we use a 44lb Bruce anchor. (Not any more, see ). And this presupposes that you've deployed sufficient scope of anchor rode, and your anchoring technique is up to scratch. What Should You Expect From a Good Sailboat Anchor? There's been something of a revolution in sailboat anchor technology in recent years. The old guard - CQR, Bruce, Danforth and Fisherman - have been challenged by a new generation of young upstarts, the main contenders being Spade, Rocna and Bugel (aka Wasi in the USA). It must hold in wind or current shifts - A real test of an anchor occurs when the wind shifts or the tide turns. In these conditions some types have a tendency to roll and pull out rather than drag around to face the new direction, and others that have failed to bury themselves completely and leave bits sticking above the seabed are likely to be tripped. A good one to start with this, as it's been around since Admiral Nelson was in short trousers. Also known as the Admiralty Pattern Anchor and sometimes the Yachtsmans Anchor, it's probably the best of all for holding in rock or thick kelp. Once set, the stock will be lying horizontally on the seabed, one fluke will have dug into it and the other will be sticking up above it, perfectly positioned to hook up with the chain when the tide turns. The stock can be released so that it can lie alongside the shank, making it an easy anchor to disassemble and stow below. But once assembled it's anything but convenient - as you'll know if you've ever tried to get one out of the water and onto the foredeck. Clearly this is never going to be a favourite bower anchor with cruising sailors. 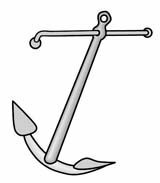 So named because it sounds like 'secure', the UK designed CQR (or Plough) Anchor has proved to be a popular bower anchor with cruising sailors since it first appeared in 1933. Like the Bruce Anchor below, it stows well in the stemhead fitting, but is difficult to stow anywhere else - and they'll pinch your fingers if not handled with care. The CQR can deal with changes in tide direction and currents through its patented swivel system, which allows it to accommodate wide swing angles before it has to reset itself. Also known as a Fluke Anchor, the US designed has been with us since the 1940's when it was developed for World War 2 landing craft. When deploying this anchor it's essential that it has no way on when it hits the seabed, or it will skate merrily over it without penetrating at all. Once properly set there's no sailboat anchor that holds better than a Danforth Type Anchor in sand and mud, but on most other types of seabed it doesn't perform well at all. And when asked to realign itself when the wind or tide changes direction it's unlikely to do so, much preferring to twist over and break out. Neither will it stow well in the stemhead fitting, but it does fold flat and stows well below decks or in an anchor locker. It also stows nicely on the pushpit, where it can be put into ready use as a kedge anchor. The Fortress Anchor is one of several light-weight aluminium anchors similar in appearance to the Danforth, but with larger flukes. 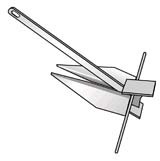 And in common with the CQR Anchor they will pinch your fingers at the slightest provocation. Also known as Claw Anchors, these one-piece British designed anchors have been around since the 1970's, when huge versions of them they were developed for use in the developing North Sea Oil Industry. Bruce Type Anchors have a reputation as a good all-round sailboat anchor, but they do have difficulty penetrating weed and grassy seabeds. On the plus side, once properly set they will realign themselves with wind and tide changes, rather than rolling over and breaking out. They're awkward to stow anywhere other than in the stemhead fitting. Another plough anchor like the CQR Anchor but without the finger-pinching tendencies of the pivoting arrangement, and of one-piece construction like the Bruce, the Delta Anchor is something of a hybrid. It's been around since the 1980s, but more recently lightweight aluminium versions have appeared which mean that you can go up a size without having to cope with additional weight. And the Best Sailboat Anchor Is...? Alacazam is 38 feet LOA so we chose a 44lb galvanised version. To a greater or lesser extent, all of these anchors meet the four principal performance criteria, but some perform better in certain types of seabed than others. For example, the Danforth is as good as any in sand, although there is a risk of it rolling and pulling out as the tide turns; and nothing beats a Fisherman in rock or kelp. For anyone contemplating the purchase of a new anchor, they should have a serious look at one of these new generation anchors. Known as the Wasi Anchor in the US, this German design from the early 1990s is the forerunner of the new breed of sailboat anchors, and the first to sport the rollover bar. The Bugel anchor a simple design which keeps manufacturing costs down, but still provides excellent performance in most seabed conditions. Like the following designs it will bury itself and turn to accommodate changes in tide and current without breaking out. 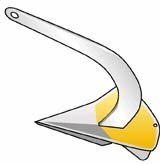 A French design from 1996, the Spade Anchor was initially developed for punching through the seagrass often found in Mediterranean anchorages. Its two-part design can be readily disassembled with a spanner (wrench) for convenient stowage in a locker, but it will stow neatly in the stemhead fully assembled and ready for deployment. It's balanced such that it always arrives on the seabed point down, which enables it to set very quickly. 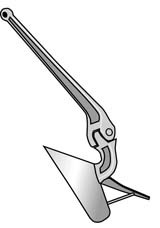 The ultimate holding power of the Spade Anchor is renowned. In my view yes; the Rocna Anchor is a winner and will very soon replace the Bruce Anchor that currently resides in Alacazam's bow roller. Designed in New Zealand, it's been around since 2004 and has become a favourite of cruising sailors worldwide. It combines the basic design of the Bugel with the sophistication of the Spade Anchor and in all the sailboat anchor test reports I've read comes out on top. Like the Bugel Anchor, it's designed to live in the bow roller; it's awkward to stow it anywhere else. The only issue with the Rocna is that it the rollover bar makes it difficult to stow in some bow fitting configurations. 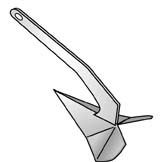 The new Rocna Vulcan is a spade anchor said to have similar holding power to the original Rocna whilst offering the greatest possible compatibility across a wider range of vessel bow configurations.